Vettius Valens was an astrologer from Antioch who lived in the middle of the 2nd century CE. Today Valens is known for his encyclopedic nine book astrological treatise called the Anthology (Ἀνθολογίαι). 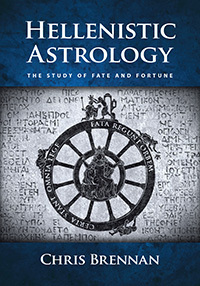 Valens is the single most important surviving source for the study of the Hellenistic tradition of astrology due to the fact that he was a practicing astrologer, he cites a wide variety of earlier sources, and he uses over 100 example charts in order to demonstrate his astrological techniques. Valens’ chronology was first worked out by Otto Neugebauer during the process of writing the book Greek Horoscopes with H. B. van Hoesen. He published a paper in 1954 in which he concluded that the majority of Valens’ work on the Anthology took place between 152 and 162 CE (Neugebauer, The Chronology of Vettius Valens’ Anthologiae). Pingree later pointed out in the introduction to his critical edition of Valens that the chart that the astrologer uses the most often as an example in the Anthology is probably his own. (Pingree, Vettii Valentis Anthologiarum, pg. v) If true, Valens was born on February 8, 120 CE. The likelihood that Valens would use his own chart as an example is bolstered by the fact that other Hellenistic astrologers such as Manetho and Hephaistio of Thebes also included their own birth charts in their works. If Valens was born on February 8, 120, then he also included his own conception chart in the Anthology, which was on May 13, 119 CE. Further work on Valens’ chronology and the date of the composition of various books of the Anthology was done by Riley in his Survey. Valens was born in the ancient city of Antioch, which is located in what is now modern day Antakya, Turkey. The Emperor Marcus Aurelius was born about a year later, so the two were contemporaries. At one point in his life Valens traveled to Egypt in search of more precise time-lord techniques, and eventually he settled there and set up a school in Alexandria. Valens was involved in a shipwreck when he was 34 years old, around the year 154 CE, and in book 7 of the Anthology he presents the charts five other people who were on the same ship. Valens’ period of activity ends after the early 170’s. This is around the same time that the Antonine Plague broke out across the Roman Empire, and it is possible that Valens was one of the millions of people who succumbed to it at this time, although this is purely speculative. The Anthology has come down to us in nine separate books. Some of the individual books seems to have originally been published as standalone units, like book 7. Other books seem to form interrelated groups, as they cover similar topics and themes, like books 4, 5 and 6 which deal with profections and time-lord procedures in general. Riley has shown that the composition of some of the books during different parts of Valens’ life can be determined by studying some of the chart examples that he uses (Riley, Survey). Some of the books of the Anthology are addressed to one of Valens’ students named Marcus. Elsewhere he apologizes that his writings are not more detailed in places, saying that he was having problems with his eyesight, and he was going through some emotional turmoil due to the death of his favorite student. It is not clear if this student was Marcus or someone else. Valens frequently draws on Nechepso and Petosiris, although he sometimes expresses frustration with their cryptic style. He also draws heavily on Critodemus, who he expresses even greater contempt for at times, at one point saying that he is all show and no substance. He mentions Thrasyllus once in book 9. Valens exhibits a type of modified astrological Stoicism. He is thoroughly convinced that everything happens in accordance with fate, and he says that astrologers are meant to be soldiers and prophets of fate. He rejects the notion that electional astrology can be used to change one’s fate. Parts of Valens’ Anthology was translated into Pahlavi (Middle Persian) sometime around the 4th century. His name was widely known in the later Medieval tradition, in Arabic, Latin and Byzantine Greek works, although he was not so widely known after the Medieval period. His reputation was such that his name sometimes became attached to historical events that he did not actually participate in. Pingree reports that there is a mid-10th century chart which supposedly reflects a horary question that was posed to Valens by the Persian king about the Islamic Prophet Muhammad (Pingree, Classical and Byzantine Astrology, pg. 236; CCAG 5, part 3, pg. 110; cf. Riley, A Survey of Vettius Valens, pg. 21). Valens supposedly predicted great things about the Prophet based on the horary chart, so the Persian king threw Valens in jail, although eventually he was saved by God. Of course, the chart is a forgery that can be dated to November 7th, 939 CE, several centuries after Valens’ death, although Pingree points out that it does give us some idea as to the notoriety that Valens had in the Medieval Arabian astrological tradition. Similarly, the Byzantine Emperor Manuel I Komnenos mentioned Valens in his 12th century defense of astrology, alleging that he was consulted by the Emperor Constantine in order to select an auspicious electional chart for the founding of Constantinople (George, Manuel I Komnenos and Michael Glykas, Part 2, pg. 32). The original critical edition of Valens’ work was completed by Wilhelm Kroll in 1908, although this was later superseded by the updated edition published by David Pingree in 1986. According to Pingree we owe the survival of a large portion of Valens’ Anthology to the noted 16th century English scholar John Dee, who compiled a massive collection of ancient and Medieval texts at his library in Mortlake, England. Dee acquired his manuscript of Valens in 1556 (Pingree, Classical and Byzantine Astrology, pg. 228). David Pingree, Vettii Valentis Antiocheni anthologiarum libri novem, B.G. Teubner, Leipzig, 1986. The first modern translation of the Anthology was a translation of only book 1 into French by Joëlle-Frédérique Bara in 1989. The translation was the author’s dissertation, and it contains an extensive commentary. The second modern translation of the Anthology took place in the mid and late 1990’s under the auspices of Project Hindsight. Robert Schmidt translated books 1 through 7 of the Anthology between 1993 and 2001, with editing and additional commentary by Robert Hand in books 1 through 6. The books were meant to be preliminary translations, and the they were funded by a subscription service that catered to modern astrologers. Vettius Valens, The Anthology, Book I, trans. Robert Schmidt, ed. Robert Hand, The Golden Hind Press, Berkeley Springs, WV, 1993. Vettius Valens, The Anthology, Book II, Part 1, trans. Robert Schmidt, ed. Robert Hand, The Golden Hind Press, Berkeley Springs, WV, 1994. Vettius Valens, The Anthology, Book II (concl. ), & Book III, trans. Robert Schmidt, ed. Robert Hand, The Golden Hind Press, Berkeley Springs, WV, 1994. Vettius Valens, The Anthology, Book IV, trans. Robert Schmidt, ed. Robert Hand, The Golden Hind Press, Berkeley Springs, WV, 1996. Vettius Valens, The Anthology, Book VII, trans. Robert Schmidt, The PHASER Foundation, Cumberland, MD, 2001. Vettius Valens, Blütensträuße, trans. Otto Schönberger und Eberhard Knobloch, Subsidia Classica, 7, Scripta Mercaturae Verlag, St. Katharinen, 2004. Bara, Joëlle-Frédérique, Anthologies Livre I: Establissement, Traduction Et Commentaire, Brill, Leiden, 1989. George, Demetra , “Manuel I Komnenos and Michael Glykas: A Twelfth-Century Defence and Refutation of Astrology. Part 1: History and Background,” in Culture and Cosmos, Vol. 5, No. 1, Spring/Summer 2001,pgs. 3-48. George, Demetra, “Manuel I Komnenos and Michael Glycas: A Twelfth-Century Defence and Refutation of Astrology. Part 2: Manuel I Komnenos’ Defence of Astrology,” in Culture and Cosmos, Vol. 5, No. 2, Autumn/Winter 2001, pgs. 23-51. Komorowska, Joanna , Vettius Valens of Antioch: An Intellectual Monography, Ksiegarnia Akademicka, Kraków, 2004. King, David A., “Some Arabic Copies of Vettius Valens’ Table for Finding the Length of Life,” in Symposium Graeco-Arabicum II: Bochum 3-5 Marz, 1987, ed. Gerhard Endress and Marita Schmeink, B.R. Grüner, Amsterdam, 1989, pgs. 25-28. King, David A., “A Hellenistic Astrological Table Deemed Worthy of Being Penned in Gold Ink: The Arabic Tradition of Vettius Valens’ Auxiliary Function for Finding the Length of Life,” in Studies in the History of the Exact Sciences in Honour of David Pingree, ed. Charles Burnett, Jan P. Hogendijk, Kim Plofker and Michio Yano, Brill, Leiden & Boston, 2004, pgs. 666-714. Kroll, Guilelmus, Vettii Valentis Anthologiarum Libri, Weidman, Berlin, 1908. Neugebauer, Otto. “The Chronology of Vettius Valens’ Anthologiae,” Harvard Theological Review, 47 (1954), pgs. 65–67. Pingree, David “Classical and Byzantine Astrology in Sassanian Persia,” Dumbarton Oaks Papers, Vol. 43, 1989, pgs. 227-239. Article notes: The article is currently incomplete, and is primarily acting as a placeholder until I have time to format the rest of article and upload it to the site.